Nelly Pellicia was probably the daughter of the anarchist quarryman Domenico Pelliccia from Carrara, who during the Mussolini regime was cautioned and warned and put on file in 1931, and together with his son Florio and daughter Nelly, fought as a partisan. Nelly appears to have been involved in the gathering of clothing to enable deserting soldiers to change out of their uniforms and to be passed from house to house before joining the partisan columns. In summer 1944 she, together with Flora Giannini and Luce Sgatti were among the young anarchist women who dug up caches of weapons, boxes of grenades and heavy machine guns hidden at Pianomaggio, Isola etc with which they supplied the partisans, according to the testimony of Flora Giannini in the anarchist paper Umanita Nova of 4th November 1945. 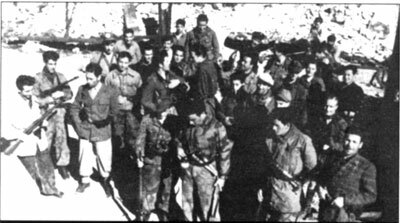 This group also provided food supplies to the partisans whilst they were on the move, dug a grave at the foot of a chestnut tree for fallen partisans, and were involved in the rescue of the wounded in the rain after a massacre by the fascists at the foot of Mount Brugiana and in the secret removal of injured partisans to a hospital. However on September 25th 1945 Nelly died as a result of typhus at 2 a.m. A report on her death noted that she was only twenty years old, was an active militant of the Federazione Comunista Libertaria (Libertarian Communist Federation), and that she had participated in partisan action throughout the period of Nazi occupation after the fall of the Mussolini regime in the anarchist column, the Gino Lucetti Battalion. “She was present wherever there was danger, supplying information and liaison services, organising supplies and participating in many battles”. Fascinating. How amazing it would be to be able to talk to somebody that has lived through experiences such as these. well, i met an old anarchist partisan at Carrara a few years ago, and I'm sure that others are still alive. Not really. Here was a person who had participated in those struggles and was quiet and modest. Ok thanks. Did you gain a lot of insight/information or was it just a brief meeting? Just a brief meeting, but I already knew a lot about the partisan detachments in the Carrara region.